​James R. Wallace was admitted to practice in the State of Arkansas in 1964. Better known as Jim (or Wallace to his friends), he enjoyed mentoring young attorneys in his law firm, Wallace and Associates. Three of those attorneys joined Jim in forming Wallace, Martin, Duke and Russell, PLLC. 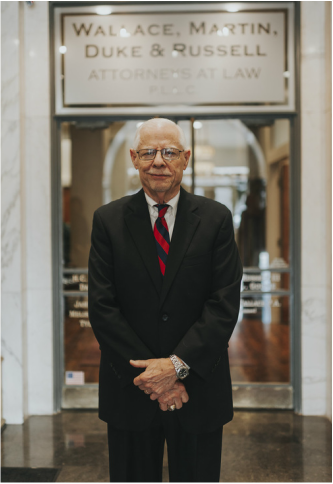 Practicing in all State Courts, as well as the United States District Court, Eastern and Western Divisions for the State of Arkansas, and the Eighth Circuit Court of Appeals, Jim has earned a reputation for the zealous and ethical representation of his clients. He is a member of the Arkansas and Pulaski County Bar Associations and the Arkansas Trial Lawyers Association. He is a former assistant city attorney for North Little Rock and served as Special Associate Justice in the Arkansas Supreme Court. Jim Wallace was born in Little Rock, Arkansas and graduated from the University of Arkansas at Fayetteville in 1964. He has been married since 1960 and has three children. He is a member of Park Hill Baptist Church in North Little Rock. His hobbies include biking, backpacking, hunting and mountain climbing. Jim's practice includes Civil Litigation and Criminal Law, Personal Injury, Estate Planning, Wills, Trusts, Business Organization and Domestic Relations.